A Macedonian ex-interior minister has been indicted by the Hague war crimes tribunal, Macedonian officials say. 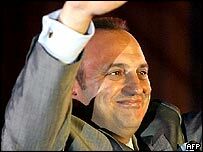 Ljube Boskovski was indicted for his alleged role in clashes between security forces and ethnic Albanians in 2001 in which 10 people died. He is currently awaiting trial in Croatia over a separate incident involving the deaths of seven South Asian immigrants. Mr Boskovski denies all the charges against him. Another senior ministry official named as Johan Trculovski was reportedly indicted at the same time. The tribunal has not commented on reports of the indictments, but if confirmed they will be the first brought by the court over incidents in Macedonia. The indictments were apparently received by the authorities in the former Yugoslav republic over the weekend but have only now been made public. They come a day after Macedonians voted in municipal elections. Investigators reportedly questioned Mr Boskovski last year about the killing of 10 ethnic Albanians in the village of Ljuboten. He commanded his own elite paramilitary police from 2001 to 2003. Mr Boskovski, who has dual Croatian and Macedonian nationality, was arrested in Croatia last September and charged with the murder of six Pakistanis and an Indian near Skopje in 2002. Prosecutors allege that he arranged for the seven to be lured from Bulgaria into Macedonia, where they were shot and then had weapons planted on them, so that Macedonia could claim it had foiled an attempted al-Qaeda attack on the US embassy in Skopje. Mr Trculovski was arrested recently and is currently being held in Skopje. Macedonia's 'mujahideen' - immigrants or terrorists?